In 2018 the National Grid Foundation provided a grant that supported professional scientific development for Boston Public School teachers. 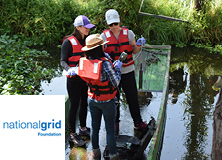 Through the Teach Earth fellowship program, National Grid Foundation gave three BPS teachers the opportunity to travel to an ancient agricultural system in Xochimilco, Mexico. Working with Dr. Claudia Ponce de Leon and her research team, the fellows spent one week acting as field scientists. While in the field the teachers created lesson plans that they brought back to their classrooms, where they then engaged hundreds of students with hands-on science. "We are pleased to team up with Earthwatch and support its Teach Earth program. Together, we ultimately are providing science and sustainability education to hundreds of Boston's students that span from kindergarten to high school through this immersive teacher training program," said Ed White, Executive Director of National Grid Foundation. "We are continually looking for ways to help solve today's educational and environment challenges. Our work with Earthwatch helps to expand the learning experience, improve the lives of young people, and build stronger communities."